All-terrain tires are a compromise between off-road and road tires. Treading on all-terrain tires is tighter than it is for off-road/mud tires, which helps them perform adequately on the road as well. They are best suited for vehicles that will be driven on the road daily and occasionally off-road. Can you use all-terrain tires off-road? Yes, but the tread on most all-terrain tires can become packed with mud, making them less than ideal for muddy trails. If mudding is something you intend to do frequently, investing in a set of mud tires is recommended.On rocky and sandy conditions, all-terrain tires tend to perform fine. How well do all-terrain tires perform on the road? Drivers can expect adequate traction in normal road conditions with all-terrain tires but may experience more road noise than with a street tire. A benefit of all-terrain tires is they give better traction than street tires on sandy and rocky road conditions and in snow as well. What’s the tread life for all-terrain tires? It varies by make and model, but all-terrain tires typically have shorter tread life than street tires because they are constructed from softer rubber. Usually drivers can expect about 40,000 miles out of all-terrain tires before they need to be replaced. How do you know all-terrain tires are best for your needs? Start by learning more about tires. Also, speak with your local Pep Boys tire expert to see if all-terrain tires are right for you. A balance of all-terrain traction, aggressive styling and on-road manners are available in one tire for today’s SUVs and half-ton trucks. 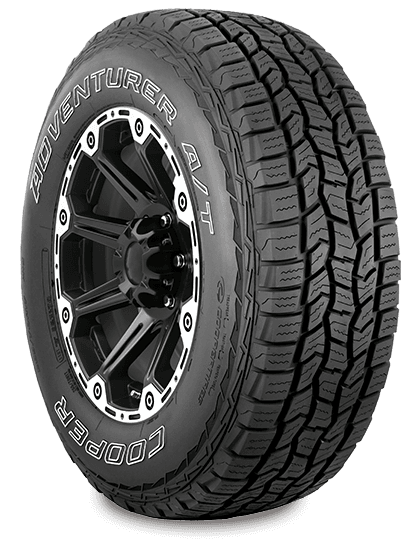 The Adventurer A/T integrates a tread and siping pattern that handles wet, dry and off-road conditions while providing dependable mileage and a quiet ride. The all-terrain, silica-infused tread compound increases grip while the enhanced sidewall improves handling. An all-terrain tire for wherever you want to go.